Gov. Mario Cuomo of New York arrives to deliver an address to the New York City Bar Association in Manhattan on Monday, Dec. 17, 2018. Cuomo announced that he would push to legalize recreational marijuana next year, a move that could bring in more than $1.7 billion in sales annually and put New York in line with several neighboring states. New York Gov. Andrew Cuomo announced that he would push to legalize recreational marijuana next year, a move that could generate more than $1.7 billion in sales annually and put New York in line with several neighboring states. 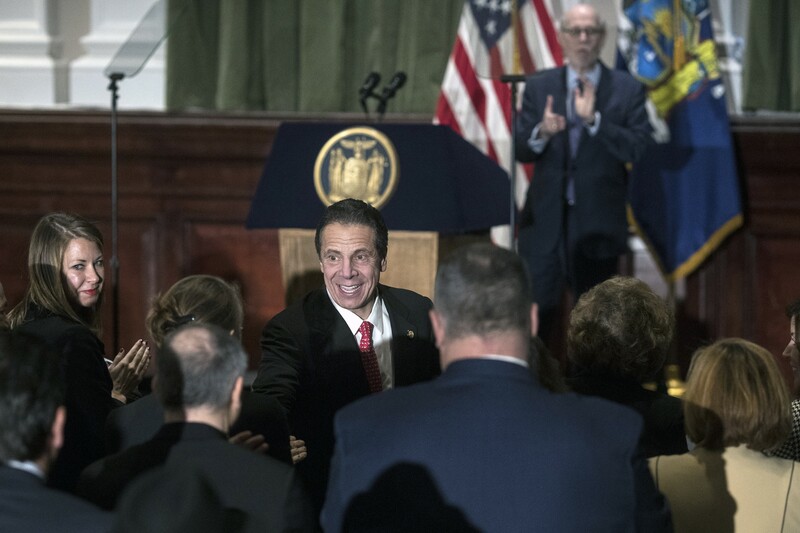 The highly anticipated proposal came in a speech in Manhattan on Monday, in which the governor outlined his agenda for the first 100 days of his third term. Cuomo framed the speech as a reflection on what Franklin D. Roosevelt — the former president who was once a New York governor himself — would do today, mixing sweeping rhetoric about American ideals with ominous warnings about the failings of the Trump administration. The speech, which seemed delivered with a national audience in mind, could prolong slow-burning speculation about Cuomo’s presidential ambitions. It also showed, in striking detail, the governor’s leftward evolution in his eight years in office, from a business-friendly centrist who considered marijuana a “gateway drug,” to a self-described progressive calling for recreational marijuana, taxes on the rich and a ban on corporate political donations. The idea is expected to win support in Albany, where Democrats captured the state Senate in November. Members of the Assembly, which is dominated by New York City Democrats, have supported such a measure as well. Legalization could bring in between $248 million and $677 million in new tax revenue in its first year, according to a report issued in July by a state Department of Health commission. In addition, it could also ease the opioid crisis and mitigate racial disparities in the criminal justice system. Already, public officials and policy groups have begun clamoring for different uses of the new revenue. One popular proposal would funnel the money into New York City’s crumbling subway system. Others have said the funds should be invested in the black and Latino communities that have been disproportionately affected by prosecution.